★Important Info: As of 2/16/2019, Harmonic Threads has a new size chart with design updates. If you have ordered with us previously, you may have a different size and will likely have a different fit. Please measure yourself and check with the size chart! Please visit our website www.harmonic-threads.com for a discount and more customizations! All items are created once ordered. Current creation time is 2-3 weeks excluding ship time from Ferndale, MI. Due to the nature of handmade, there may be some slight variances in your clothing creations. We hope you will enjoy that these were handmade with love just for you! Please take the time to read all shop policies before placing your order. Thank you for supporting small and handmade businesses! The Goddess Onesie was designed to look like a dress without being one! The bodice is double layered with a lace up back and has flowing legs. Harmonic Threads does not offer custom sizing, patterning, alterations or mending. We do offer returns or exchanges within 14 days- we understand online clothing shopping can be tricky! XS (0-2) - Bust 32- 33" | Waist: 25-26 | Hips: 34-36"
S (4-6) - Bust: 34-35" | Waist: 27-28" | Hips: 37-38"
M (8-10) - Bust: 36-37" | Waist: 29-30" | Hips: 39-40"
L (12-14) - Bust: 38-40 | Waist: 31-33" | Hips: 41-43"
XL (16-18) Bust: 41-43" | Waist: 34-36" | Hips: 44-46"
XXL (20-22) Bust: 44-46" | Waist: 37-39" | Hips: 47-49"
French Terry and Stretch Fleece: These are both warmer, thicker options for colder climates. Both are a 95% cotton 5% spandex. Hemp/Cotton/Spandex: Made from a light-medium weight blend. 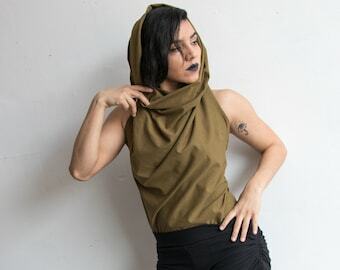 53% Hemp, 44% Organic Cotton, 3% spandex. 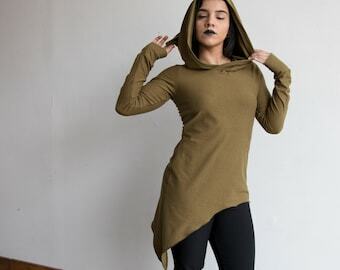 Organic Bamboo French Terry: A thicker and warmer option that works wonderfully for leggings. 66% Bamboo, 28% Organic Cotton, 6% spandex. Our organic fabrics are dyed with low impact environmentally friendly dyes. See last photo for color/fabric options. Please note that colors may look slightly different on your computer screen than in real life, and dye lots may vary slightly. Some lighter colors such as ivory, khaki, and natural hemp (if left un-dyed) are slightly sheer. > Please read shop policies for information on shipping and returns. By purchasing from Harmonic Threads you agree to these policies. This items is great! Really well made. I plan to wear it before I get into my dress and after I get sick of the dress on my wedding day. The only down side is the white lace is a little see through. But I am sure I can figure something out. Super comfy, beautiful and flowy! My only issue is that the string in the back seems a bit short, but it's an easy fix. This suit is absolutely beautiful, its cut perfectly for my bottom heavy body and hugs in all the rite places in the top halter. Thanks so much! We accept Paypal or major credit cards through Etsy direct checkout. International orders- Please know your country's import and customs taxes. Harmonic Threads is NOT responsible for these extra charges! In the event that you are unhappy with your order, please contact us within one week of receiving the item. We do not do alterations, however returns or exchanges are accepted! Unfortunately we only do returns for international orders, no exchanges due to the high shipping costs. Exchanges or returns must be postmarked within one week after the delivery date of the shipment. Please include a note with your name, order number, and size/color of item you are exchanging for, as well as a check or cash for the return shipping. To qualify for exchange, your item must be in its original, unworn condition (other than to try it on), free of pet hair, perfume, smoke or any other odor. I cannot accept exchanges for any items that show signs of being worn or if received after the exchange period. Once the item is received, we will send out your replacement item within one week. Exchanges or returns must be postmarked within one week after the delivery date of the shipment. Please include a note with your name, order number, and that you are returning items in the package. To qualify for return, your item must be in its original, unworn condition (other than to try it on), free of pet hair, perfume, smoke or any other odor. I cannot offer refunds for any items that show signs of being worn or if received after the return period. Once the item is received, you will be credited back the full price minus the original shipping cost. We cannot refund shipping. Thank you for your understanding! International orders: Returns are accepted however we do not do international exchanges. ORDERS IN USA ~ Items are shipped via USPS Priority mail with tracking number. Orders over $250 will require a signature. Orders usually arrive 2-4 days from the day they are sent out. Check your email associated with your Etsy account for the tracking information once your order has been sent. INTERNATIONAL ORDERS~ Why so expensive? Items are shipped via USPS Priority mail which includes tracking and insurance. We can ship first class without tracking or insurance for a smaller cost, however we take zero responsibility if something happens to the package while in transit. Ship times can vary from country to country, and if they get held up in customs or not. Please know your country's shipping policies and import taxes. Harmonic Threads is NOT responsible for any tax/customs charges. What you pay us is strictly for the shipping cost only. If you prefer a shipping company other than USPS, please contact me before you purchase so we can make arrangements and corrected shipping charges. Once a package has been shipped it is out of Harmonic Threads' control and in the hands of USPS. If a package has been lost or damaged during transit- please contact us within 48 hours to work out a claim. If a package is lost in transit, we will provide a 50% off coupon to repurchase your order, we do not do refunds on missing packages. We are not a major company like Amazon, thank you for understanding. Purchaser is responsible for providing the correct shipping address. If an error has been made, purchaser is responsible for any re-routing fees or extra shipping costs that may occur from said error. Please contact Olive at info [!at] harmonicthreads.xyz for a copy of our wholesale PDF!